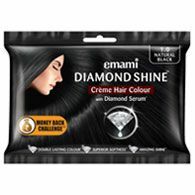 Emami introduces a path-breaking crème hair colour, Diamond Shine, created by renowned international and Indian hair colour experts. It’s superior formulation ensures that the hair colour lasts 2 times longer. It is enriched with Diamond Serum that gives your hair amazing Shine. It’s 11 Ayurvedic herbs and conditioners protect and nourish your hair. This no-ammonia formula ensures 100% grey coverage. Say hello to the luxury of double lasting colour! Available in 5 gorgeous shades at Rs.30 for a 20g + 20ml pack. Q. Does frequent use of hair colour lead to premature greying? A. 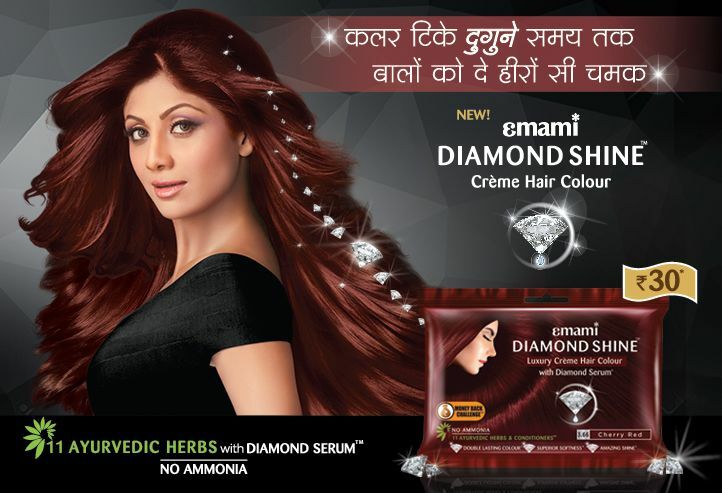 Frequent use of hair colours like Emami Diamond Shine, do cause grey hair. Ageing, hereditary reasons and lifestyle do. Hair colour only coats upper keratin layer and has no effect on hair follicles. Leave your fear aside and stay colourful and beautiful. Q. Does colouring your hair lead to hair fall? A. No. There are various factors involved like stress, tension, diseases, genes, hormonal imbalances, lifestyle, climatic conditions etc. which may result in various hair and scalp problems like weakening of hair roots. ALOE VERA: Makes hair more manageable, smoother, silkier and healthier. AMLA: An excellent hair conditioning herb. METHI: Provides natural proteins, preserves hair colour and keeps hair silky. HIBISCUS: Increases hair density, softness and shine. ALMOND: Prevents greying and tapering of hair, makes hair silky & shiny too. GREEN TEA: Strengthens hair and manages split ends, controls dandruff and hair loss. HENNA: Coats the hair shaft, seals in moisture, tightens the cuticle and makes hair silky. BRAMHI: Improves blood circulation and cools down the scalp. TULSI: Provides adequate nutrition to the hair shafts. NEEM: It is anti-dandruff, used for scalp treatment. BHRINGRAJ: Promotes hair growth, prevents premature balding. ORANGE PEEL: It has light conditioning properties.